Syracuse basketball would return to the court after the cancelled season. 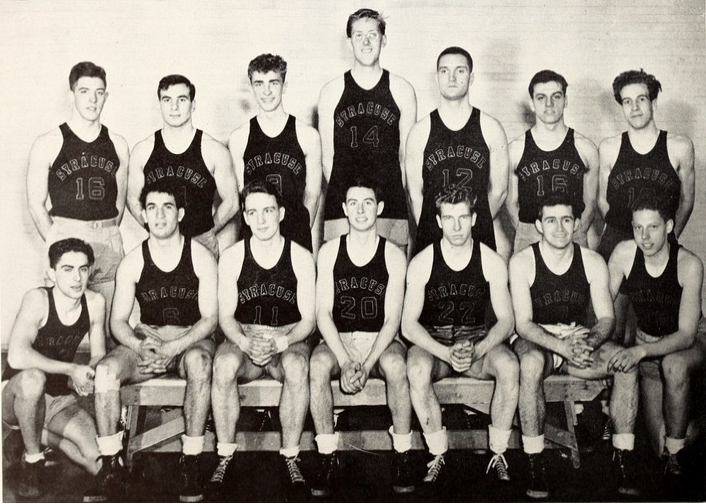 The Orangemen would field a team consisting primarily of freshman. Freshman forward Francis Miller would lead the team in scoring and guard Bill Hennemuth would be second. The team was aggressive, but lacked experience on the court. Doc Acocella, star of the football team would share starting guard duties with Oliver Renzi, and Bill Dickie, and Rudy Cosentino would also see time as starters. Coach Andreas had 6'10" John Ludka on the team for some height, but 'Long John' was very raw in his skill and had a lot of developing to do. The Orangemen would win their first five games, on average by a large margin. This was really an illusion regarding their talent, however, as those were lesser caliber teams than they would face as the season progressed. Sure enough, the Orangemen would lose 12 of the last 14 games of the season, to teams that were far more experienced. It did not help that Hank Schultz, their top performing player early in the first semester, had to leave school to complete a military obligation. Their two wins would be close games against rival Rochester (47-45) behind a stellar night from Miller with 20 points, and a 45-43 win over Sampson Naval Training School. Syracuse would finish with a record of 7-12, their fewest wins and worst record since the 1910-1911 season. However, inexperience and rebuilding the program after a year off were the primary reasons for the results. There was a bright spot, the stellar play of Stubby Miller, who continuously improved over the season and was the primary scorer down the stretch.